Here, five surprising ways to use harissa. 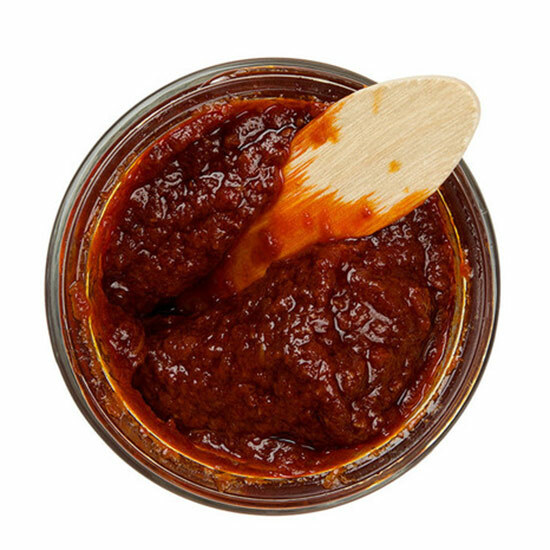 Whether you’re just getting to know harissa or it’s been a staple on your shelf for years, NYSHUK's version of the traditional North African pepper condiment will surprise you with its clean, fresh, perfectly balanced heat and spice. It's one of the artisanal stars in F&W's collection for Mouth.com, online retailer of delicious indie foods. It's great on anything you would cover in Sriracha, but also much more versatile. Here, five surprising ways to use NYSHUK’s harissa. 1. Mix it with mayo, slather it on a bluefish fillet and broil until the fillet is cooked through and nicely glazed. 2. Blend it with olive oil and orange juice and toss with edamame before nuking. 3. Blend it with fresh goat cheese, roll into small balls and roll in chopped almonds for tasty appetizers. 4. Mash it with avocado and lemon juice for a Middle Eastern take on guacamole. 5. Stir it into tomato sauce to serve with lamb meatballs.